We begin with the idea that for some reason you want to get into space. Or maybe, like me, you want to explore the final frontier. For whatever reason you like best, this series of posts begins with the idea that you want to get to space, and stay there. So, how do we get there? Maybe, but more importantly, it’s my frontier. I have been obsessed with space and space exploration my entire life. Most likely this began with my mother sitting me down to watch Star Trek at an early age, although she still pokes fun at how I didn’t, at the time, like “day-time Star Trek, only night-time”, the former being The Original Series and the latter being The Next Generation. As I grew older, the final frontier didn’t loosen its hold on me. I read every book I could on the subject, tried to make every school project relate to it, and of course, continued to watch Star Trek. My parents fostered this dream, and shared it, loving every odd fact, idea, and invention I threw their way. My dad’s fascination with star-gazing even inspired my mom to get him a telescope to celebrate their wedding anniversary. I have just about completed my Bachelor’s degree from York University, where I’ll obtain my Bachelor’s of Applied Science, Specialized Honours in Space Engineering. I plan on continuing my quest by obtaining a Master’s program in space engineering, and thereby become a qualified professional in the fascinating field of designing systems and spacecraft for, you guessed it, space. But enough about me; I am starting a new series of posts aimed at bringing what I have learned to your attention. I have often found people interested in what I do, but it’s not always the easiest topic to bring up at a party. Actually, that’s not true, I’ve done it, and to a roaring success, but I’ve decided that I wanted to take you all on a tour of how to get to space, and what you’d need to do once you get there. I will do my best to walk the line between entertaining and educational, however should you have further questions or comments, please let me know, I am always looking for feedback. In addition, if anyone finds any fault in my logic, please let me know. I am not afraid of admitting I’m wrong, and I’d rather have it pointed out and questioned than assumed to be right when that isn’t the case. Finally, if you have any ideas for further posts, I would love to hear from you! So join me next time, when I walk you through the math and forces which need to be understood if you're going to break through into that final frontier! 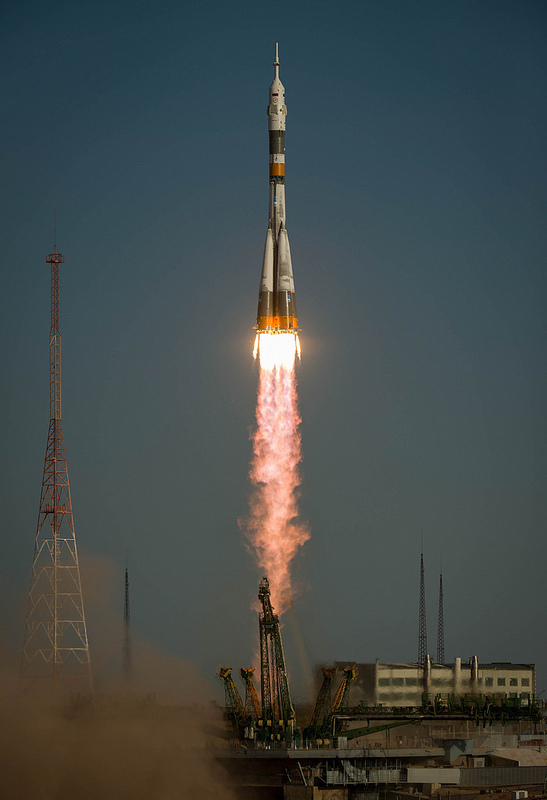 For now, enjoy this Russian Soyuz rocket launch photo! It has been said that genius is 99% perspiration and 1% inspiration. I am reminded of this many times in my life when I work, and toil, and labour over something, make no progress, and then in a flash, something changes. Not too long after writing my last post, I took a closer look at Master's programs in Europe and made an incredible breakthrough! First off, I found this website, Master's Portal, which helps to sort through academic programs in Europe, filtering results in many ways including type of program, cost, and location. I have complained about not being able to find a website like this for quite some time, and I wonder why I was not able to find it before. Of course, now that I think about it, it might have been recommended to me last year by my friend Meredith, but either way, I'm glad to have found/re-found it. Coming from a small town where only the teachers had gone to university, and being the first in my family to attend university, I have found my quest for higher education to be a little challenging. Anyway, so I found the above website, and I typed in 'space' under the keyword section. I kept it super vague because I had my doubts as to how well this website would work. I was pleasantly surprised when I obtained 184 results from all across Europe. Not wanting to limit my options too much, and excited by the prospects, I reviewed them all. From that, I found 10 programs which looked really interesting, and from that, I've narrowed it down to 3 which I really like and 2 which are okay. Of the three I really like, 2 are in the UK, and 1 is in France. I couldn't believe it! I was so happy! I finally found programs which I didn't have to just say maybe to. Of the programs I mentioned in my previous blog post, every single one of them only interested me because I thought there might be some flexibility to make the program more about engineering for the space environment. They were all general electrical engineering programs which I thought could be interesting, with effort. But, check these programs out! Designing for space! I couldn't believe it, I had to read these programs several times. I went to the school's websites, looked through every shred of information I could find, worried the whole time that I had missed something really obvious, that there would be some reason why these programs would not work out, that I would be back to not knowing where to go. But as far as the academic credentials are concerned, these programs are perfect! Cutting edge, connected very closely with the industry, each program offers a chance to learn more about the space environment and designing therein. Each school offers a term of lectures comprised of mandatory and optional modules, and some offer both a team and group project. The Master of Space Studies, in France, offers an internship where you work with/for a company, getting some great experience in the field and making it that much easier to work in the field once you've graduated. Each and every course I've seen from all of the schools really interests me. Subjects like: Space Propulsion, Structural Mechanics, Life Support Systems, ans so many more, they sound straight out of Star Trek and I am really looking forward to learning all that I can. The only real catch is the cost. $23 000 - $33 000 just for tuition alone. That's crazy. I mean, that's pretty much double what I was expecting to pay here in Canada for even the most expensive of universities. So what to do? Well, the responsible option would be to wait a year, save up some money, and then head overseas. And I might just do that, yet again, I might not. Another advantage of these programs is that they're only a year long and they seem to have a great connection with many great space industry institutions and companies. I have some time to think about it, as applications aren't due until March at the earliest. I have already done most of the work, I just need to secure some references, and look into living arrangements overseas. Well, I also have to figure out how to afford it, but I've been looking into scholarships and loans, and I'm sure once I get the chance to show people my enthusiasm, dedication, and qualifications then the rest will work itself out, as it always does. In the meantime, I've been working on a side-project or two, and getting ready to move back to Toronto. I've been reading, a lot, about the space environment and designing therein, and it feels amazing to be focused in a way I haven't been in a long time. I wanted to get more specific about the programs and what it is I'm working toward, but I think I'll leave that for another day. I plan on writing a series of posts about my studies, hopefully presenting my knowledge and dedication whilst keeping the subject matter entertaining and enlightening. I look forward to sharing that with you, and as always, thanks for reading. This blog post is more important for the writing of it than the sharing of information. I say this because I have been very good, almost too good, at keeping in touch with my friends and family lately, and this blog post is about my life and what has been happening in it. Thus, if you happen to be a frequent reader who is more interested in my engineering endeavours, or my D&D creativity, please skip to the end of the post, and stay tuned for future updates. Normally, I would apologize for the verbosity and introspective nature of this blog post, but I don't really think I have to. Since the last post, a lot, and yet only a little, has happened. Life has been neutral at best. If one could scale my impression of the last month between 1 and 10, the latter being the best, I would rate the average to be 5.5. Why you serious? You may ask, well, I have been going through some introspection and working on my life and making some changes, and that can be tough. Long story short, I am single again and have spent considerable time inside my own head, which is both good and bad. Now, before you get too down, I want you to know that this post has a happy ending, but I want to work through the negatives before I get to the positives, it's how I work, and it's how you're going to read it. First off, the choice was mutual, although I will admit I did not take it well. Without boring you of the details, the timing was not right and neither of us were ready for the seriousness our emotions might have suggested. We both decided that this was the best way for us both to take care of ourselves and what needed to be done. I made a promise to myself, and to her, that I would do the right thing if/when that time came and that I would not make things difficult. I broke that promise, and I have been fighting my shame. [Mind] "I am in control of everything, all the time, no matter what." [Heart] "Can I be excited or sad about [random topic]?" [Mind] "Yes, but only a little." That is how I work, all the time. While I may appear to wear my emotions out in the wind for all the world to see, it is all actually carefully controlled and processed. By the time you see it, it's been filtered, weighed, considered, and delivered. I understand how you might either doubt this, or find it difficult to understand. But that's how it is. Except...when I find a companion who shatters that shell. This has happened to me a few times now, and so I recognize it. Part of me wants to find that someone, that person who I feel most comfortable with, who breaks through that shell and is able to glimpse that part of myself I rarely even let myself see. When this happens, my emotions, reactions, thoughts, everything, is unfiltered and delivered as it happens. Which, is a little difficult for me or the other to bear, and I have grown to understand that about myself. Anyway, so we broke up, mutually, and then I accidentally was a little too...open about my feelings. Truth be told, I work extremely hard to keep myself focused and disciplined, but sometimes I become too close and too comfortable with someone and my heart, which has gotten used to being so open and unfiltered with that someone, now thinks it runs the place. What's even worse is that I cannot even defend myself and say I was being true to myself and my emotions, and that's the other bad thing; I was not only too open and emotional, not giving the appropriate time and space needed to heal, but I was speaking with my heart which was saying things which weren't true entirely to myself. My heart was only thinking about how sad I was and how happy I was before. It ignored my brain which was saying this is the right thing to do, and ignoring my brain which was telling me that we needed to give each other space to work things out. But, I have moved past this, I have apologized and am working toward being friends again, like we used to be. I am providing this analysis, explanation, and apology for two reasons: I hope she and some previous ex-girlfriends see this so they may better understand and forgive/accept this about me, and secondly, I realize that I do and have done something similar to my friends, albeit to a much smaller extent. But, things have moved forward, as standard conventions of time would dictate. My only lingering thought on the above, other than the hope that I learn from this, is that I hope to bridge understanding so that we may again be good friends someday. And while most of me is completely content with working on myself and my life and leaving her alone so she may do the same, there is a part which adds to the normal amount of missing a friend which hopes that we can again spend some time together before I move back to Ontario. Part of me worried about writing that just now, as I am not intending to add pressure to the situation, but I realize everything I say can and will do just so and so I might as well be honest. Still, it's only been a month, these things take time. So, what else have I been up to? Well, the first big thing has been my focus on graduate school. I have been looking for sometime, and have narrowed down quite a number of things. The first thing I did was I set out to do nothing but think about what I wanted to do with my life and career. While I had done this a long time ago, the past two years at York have really distracted me, and one of my reasons for coming out here was to be alone in my mind and cut through all the distractions. In the end, the answer was simple, as it always is. I want to design spacecraft and spacecraft systems to work and work better in the space and extra-terrestrial environments. I have always wanted to put things in space, and now I really want to help be part of the innovation and the space industry, and help make exploring easier and better. I have to narrow down exactly where I want to specialize, but that's what grad school is for. I want to spend the next two years becoming an expert on spacecraft design and by the end of graduate school, be a Master (pardon the pun) in a certain area. I haven't determined exactly what area yet, but I think it leans toward electronic/software design as that is the area with which I have the most experience. Where does one go to look into this type of career? You, or a version of me from the past, may ask. Well, there are several places to look. First, there is the international option, namely, the US, and/or a lot of places in Europe, and even China/Japan. The latter especially because they are devoting a lot of money toward their space programs right now. But, that is not the path for me. I have given it a lot of thought, and I have determined two things: I don't want to live in the United States (too many negative reasons), and I haven't found the right program in Europe, which is my preferred choice if I were to study abroad. While I have seen some programs which look quite interesting in Europe, Canada has always been a great contributor to this industry and we have some of the best programs I have seen. Plus, financially, it would be difficult. Not that this makes much of a difference, because I am idealistic enough to not settle and I usually weigh the academic credentials more carefully than the financial. So, same question: Where does one look? So far, I have some options in Ontario, one in Quebec, and one, surprisingly enough, in Calgary. I have more research to do, and more to say on that matter, but this post is getting longer than I wanted. Suffice it to say, on the matter of grad school, I have been spending a lot of time finding out what I want to do, and when I'm not looking at the schools themselves, or the professors/research being done at them or reading up on the subject of spacecraft design, I am only working on one other project. I will get back to you at a later date with more thoughts and my decision. I plan on having all of the paperwork, research, and applications finished by November, which is incredibly early as most of the applications do not have to be in until January, March, or June for some of the schools. So there you have it. It's not a lot, in terms of an update, but I have spent most of my time working on directing my future and while it's a lot of work, it's not something one can talk about too much without boring the reader. Also, it's amazing to know what you want to do and to spend your time doing it. I have been just flying through books from the local libraries on this subject and it makes me feel very happy to know that I've found something to which I so eagerly want to pursue. Most people spend their entire lives looking, and I've been fortunate enough to have always known; I just needed the reminder.